- Why dividend run-up is stronger in some countries and less in others? - Understanding why under-allocating to global shares leads to a sub optimal asset allocation? - What are the benefits of global income diversification from a stock and sector perspective? - Can you generate 6% income p.a. from global shares? - Who loses most from the ALP proposal to remove franking credits? - Australian equities - the real impact for dividend imputation and retirement income? - Will global equities and other asset classes become more attractive from an income perspective? • How did dividends hold up? • Will resources keep delivering? • Will interest rates rise in 2018? •Banks - could they cut their dividends? •Are resources the new high yielders or dividend traps? •Is 9% income p.a. in retirement possible? •What does the new assets test mean for a retirement income? •What are some investment strategies that can assist retirees / SMSF's in achieving higher income and total return? •What is the sustainability of bank dividends? During our 20 minute webinar Dr Don Hamson (MD of Plato Investment Management Limited) will address the income crisis facing retirees/ SMSF's and if any solutions exist? •Where are global interest rates going? •What are negative interest rates and will they come to Australia? •Is income investing becoming more risky? The webinar will be followed by a live Q&A session. During our 20 minute webinar Dr Don Hamson (MD of the Plato Investment Management) will provide a quick recap of 2015 and then discuss income opportunities in 2016. - What are the disadvantages of traditional global equity income strategies? - Does a low yielding global portfolio lead to sub optimal asset allocation? - Can you generate 6% p.a. income (4% above the market) from global shares? During our 15 minute webinar Dr Don Hamson (MD of the Plato Income Fund) will discuss the latest reporting season, in particular focusing on the income opportunities. - Which companies disappointed & impressed during reporting season? - Banks: recapitalisation, maintaining dividends & outlook? - What companies increased/decreased their dividends & what is their outlook? - What companies were dividend traps? 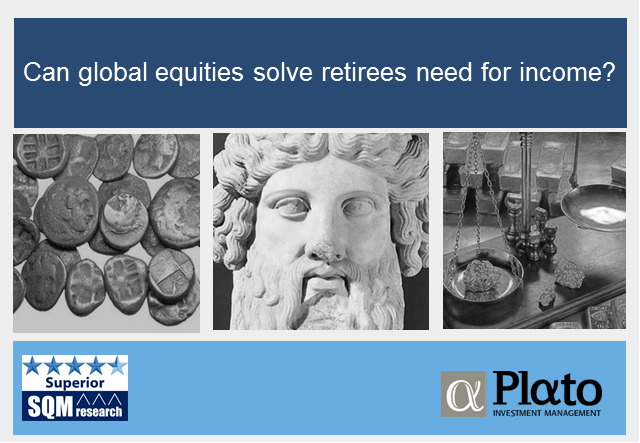 During our 15 minute webinar Dr Don Hamson (MD of the Plato Income Fund) will discuss why diversification doesn't work in times of high volatility. During our 15 minute webinar Dr Don Hamson (MD of the Plato Income Fund) will discuss how tinkering with superannuation and imputation could put retirement incomes at risk. - How Plato delivered 9.4% income + capital growth over the last 12 months. During our 15 minute webinar Mark Thompson (Senior Portfolio Manager at Plato) will discuss the the price of high yield stocks. S&P Dow Jones Indices has created a tax-aware indices specifically designed to incorporate franking credits and dividends. During this webinar Dr. Don Hamson discusses with Daphne van der Oord the introduction of this new indices and what it means for pension investors and clients. incorporation of franking credits for pension phase (tax-exempt) and accumulation phase superannuation. How important are franking credits? During our 15 minute webinar Dr Don Hamson (MD of the Plato Income Fund) will discuss the outlook for 2015 and where to find income. Title: Can global equities solve a retirees need for income?